WARNING: THIS PAGE CONTAINS NUMEROUS SPOILERS! You shouldn’t read any further on this page until you have read the books themselves lest you spoil the fun by learning important plot points in advance. 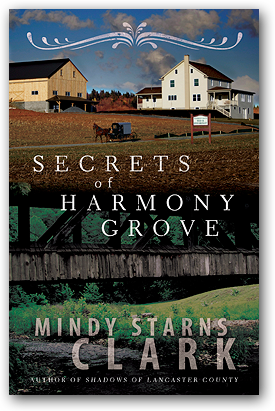 Have you read Secrets of Harmony Grove yet? If not, you really should read it first before proceeding. Spoilers ahead! FICTION. 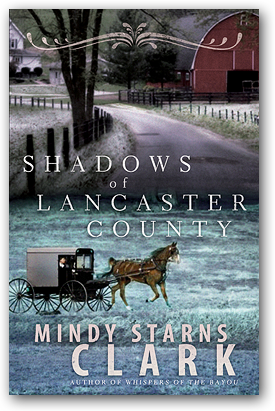 The setting for this story centers around Harmony Grove, which Mindy has located in Lancaster County, PA. In the story, the grove's design is based on a similar grove in Germany which uses as its focus the epic poem Metamorphoses by Ovid. Both groves are purely fictional and do not exist except in the imagination. FACT. The poem they are based on, Metamorphoses by Ovid, is real. Many thanks to A. S. Kline, who graciously allowed Mindy to use his English translation of Metamorphoses for her story. FACT. Though the characters in this story are fictional, the things that happened to them during the Holocaust are based on real events that happened to others. To honor the truth of that era, Mindy tried to "fictionalize" those parts of her story as little as possible. As she explains, "When I first begin to write a novel and I have a general idea of its plot or subject matter, I will do some preliminary research to get a better idea of the big picture. Starting with my wonderful local library, I will gather books and DVDs on the main topics and immerse myself in them. As I was doing this for my study of the Holocaust, I randomly popped the DVD Night and Fog into the machine first, before I had read or watched anything else. What I saw stunned me to my very core. I don't care how much I thought I knew about the Holocaust, it took this film to open my eyes to the reality of it all. Thank goodness my mother-in-law was visiting at the time and was willing to watch it with me; otherwise, I may have turned it off from sheer revulsion. Instead, together we took in the astonishing images of the emaciated prisoners, the dead bodies being shoveled into graves by giant tractors, the astonishing casualness with which so many millions of people were murdered. "Overall, educating myself about the Holocaust was among the most difficult—but significant—research I have ever done. I think the documentary Night and Fog, which shows actual footage of the atrocities at the concentration camps, should be required viewing for every person on this planet over the age of 16. In my opinion, it is far too easy to think of the events of the Holocaust in vague, less specific terms, as I guess I always had. But these atrocities must never, ever be glossed over or forgotten. Certainly, my eyes have been opened, and I am still reeling from the shock of it all." Though Buchenwald had no gas chamber, many of its prisoners were killed in its Execution Room, where they were garroted behind the ear by meat hooks and hung along the walls until dead. (According to the Buchenwald guidebook, about 1,100 people were killed this way.) Next, the bodies would be sent upstairs via a hand-operated elevator to be burned in the ovens. Sometimes when workers were in a hurry, they wouldn't wait until those who were hanging had died but would instead take them down from the hooks prematurely and send them upstairs. There, they would then be loaded into the ovens, alive, and burned to death. Visit www.scrapbookpages.com for photos and more information. FACT. Though the grove is fictional, the description of its "German Gate" is based on one of the gates at Buchenwald, as shown in this photo. FACT. In Mindy's research about the war, she was surprised to learn that there had been groups of trained Nazi resistance fighters known as the Werwolves. Because their name fit in so well with her story, she couldn't help but include them. Visit here to learn more about the Werwolves and their activities during the war. FACT. Mindy happened upon the cassowary quite by accident in her research about emus. When she read that the cassowary is the "deadliest bird in the world" she knew she would have to find a way to work one into her story as well. With both emus and cassowaries being members of the Ratite family and susceptible to avian coccidiosis, she thought this could throw some red herrings into the mystery in a fun way. But are they really that lethal? According to the article "Cassowaries: Casuaridae—Behavior And Reproduction" on the Animal Life Resource website, "when cornered or threatened, the cassowary will lash out, charging their victim, kicking and slashing with their razor-sharp claws. In 1999 there were 144 documented cassowary attacks on humans in Australia, six causing serious injury. There were also cassowary attacks on dogs, horses, and one cow. The last reported death from a cassowary attack occurred in 1926 when a sixteen-year-old boy was killed by a single kick to the neck after hitting the bird with a stick." FICTION. To Mindy's knowledge, a cassowary has never been used for blood sport. FACT. However, as she explored the world of animal fighting, she did run across one story of a canary and finch-fighting ring in Shelton, CT. In 2009, police followed up on a tip of illegal animal fighting and ended up arresting 18 members of the ring and seizing 150 of the birds. If people are actually using canaries and finches for blood sport, Mindy decided, it wouldn't be that big of a leap to imagine them choosing to do the same with a cassowary, which is of course a larger and far more dangerous animal. FACT. Mindy had great fun learning all about hidden rooms, and she found a number of nifty books, articles, and websites on the topic. The entrance to the room in the basement of Harmony Grove Bed & Breakfast was based on an actual "trick" staircase, which is described and shown at this site. FICTION. There is no "Harmony Grove Bed & Breakfast" except in the pages of this story. Both are lovely establishments with warm hosts and a variety of accommodations. If you go, be sure to tell them Mindy sent you! 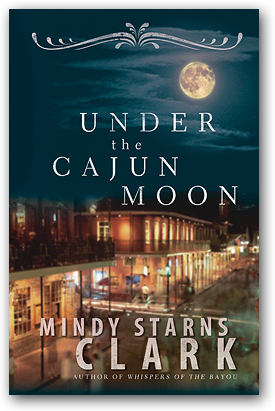 Have you read Under the Cajun Moon yet? If not, you really should read it first before proceeding. Spoilers ahead! In the story, Jacques Soliel and his father fall victim to a devious plot (solid gold statues switched with brass gilded statues) masterminded by a man named John Law. Though John Law was a real person, this particular scheme is fictional and no gold or gilded fleur de lis were ever commissioned by the French crown—though the storyline was based on other, similar schemes that really were perpetrated by Law at that time. John Law lived in France during the historical period depicted in this novel. A brilliant economist from Scotland, Law was also a scoundrel and a swindler. With the economy of France in a slump, Law convinced the French Regent to try a system of paper money—an idea that was revolutionary for the era. This worked well for a time as the economy revived and then flourished, creating mass wealth, inflation, and a frenzied stock market. Part of Law's moneymaking schemes involved the settlement of the Mississippi Territory for France, something that grew more and more difficult to do as word spread throughout Europe that the region was dangerous, miserable, and nothing at all as described in Law's propaganda. He circulated posters showing a land of plenty, one where diamonds and gold could be scooped off of the ground at will, when in fact much of the Mississippi Territory was swampy, ridden with pestilence, and virtually uninhabitable, with neither gold nor diamonds anywhere to be found. For the territory to succeed, most of all Law needed to establish the city of New Orleans, and he sent numerous ships to the region in an attempt to populate it. Unfortunately, the transatlantic crossings were deadly, and many ships that left France with 200 passengers or more made it there with fewer than 50. Even many of those who made it soon died of starvation or disease once there. Still, France needed a port city in New Orleans, so the crown allowed Law to use more and more radical schemes to populate it. Soon, France was shipping out its homeless, insane, criminals, prostitutes, and more, all in an effort to populate New Orleans and the rest of the Mississippi Territory. Believe it or not, weddings like the one that poor Jacques is subjected to in the story (random, forced matches between prisoners and the insane) actually did take place! For a brief period, there was even a law in France that anyone who could not show gainful employment for 4 days in a row was to be deported. Greedy and ambitious, Law ultimately printed more paper money than there were gold stores to back it up, and an inevitable run on the bank almost singlehandedly destroyed the economy of France. In the end, he fled the country in shame, despised throughout Europe and up and down the Mississippi River. Here's a very clever, very-well-done animated history lesson on this topic, from the National Film Board of Canada. The city itself is depicted in numerous historical documents much as Jacques describes it in the story. It really was a difficult place in the beginning, populated by the dregs of society, ridden with pestilence, and constantly flooding. With no middle classes to do the skilled labor, the settlement was nearly doomed. If not for the German farmers who settled upriver and began cultivating fields and growing crops, New Orleans may well have been starved out of existence. The city also owes much credit for its survival to the Catholic church and in particular to the Ursuline nuns. Over and over, historical documents and personal correspondences from that era show how tirelessly they met the needs of the poor and downtrodden and how fervently they prayed for God's blessings on the place despite its shocking lack of morality. In Mindy's opinion, though New Orleans is still a complicated city (with plenty of immorality to go around) it also somehow continues to maintain a sense of reverence and a spirit of God's grace, one she sees as a testament in part to the prayers of those nuns so long ago. One more historical note: In the story, the mob scene takes place at the "Place d'Arms." That was the name of what is now known as Jackson Square. Ask a Chitimacha where their tribe originated, and they will tell you "We have always been here." Indeed, the Chitimacha can trace their earliest settlements back to approximately 500 AD. Through the years, the Chitimacha thrived so much that at one point their population numbered more than 20,000. In the 1700's, as France attempted to colonize the region, the Chitimacha came under attack and suffered much persecution and hardship. In the ensuing years, encroached upon by France, Spain, and the US, their numbers drastically decreased. Though deeply decimated, they managed to survive as a people and even retained some of their original tribal lands. These days, things are looking up for the Chitimacha. There are approximately 950 members of the Chitimacha Tribe, and of those, approximately one third live on the reservation in and around the picturesque town of Charenton, LA. Their tribal government is impressive, overseeing programs and facilities that include a Trading Post, Tribal Museum, Multi-Purpose Office building, Health Department, Tribal Courts, Police & Fire, Senior/Youth Center and Tribal School. Their largest commercial development is the highly successful Cypress Bayou Casino. The last surviving speaker of the Chitimacha language died in 1940, making the language extinct. Fortunately, archived recordings survived, and these days Chitimachan is being revived both as a verbal and written language. A visit to the reservation, particularly the museum, is a fascinating experience, one that communicates a deep sense of pride and dignity, strong ties with the past, and great hope for the future. To read about the language, visit www.bigorrin.org. To see recipes for Macque Choux and other regional favorites, visit www.chitimacha.gov. As shown in the story, the town of Charenton, LA, really does seem to have been named after the mental institution in Charenton, France. According to legend, the name "Charenton" seemed like a logical choice because it was often said that the region was so isolated from the rest of civilization that one would have to be crazy to live there. The coordinates used in the story to pinpoint the treasure do not reflect accurate coordinates for Paradise, the fictional land mass that Mindy created for this story. In fact, using Google earth or similar to view those particular coordinates reveals a region directly in the middle of the Atchafalaya River just north of Patterson, LA. This was intentional on the part of the author. Because the story deals with a fictional hidden treasure, and thanks to the numerous satellite images that are now easily available via the internet, Mindy did not feel comfortable directing curious readers to anyone's private property. To her mind, the fictional island known as Paradise was actually located somewhere north and east of the coordinates given, but not too far. The story of the Lake Peigneur disaster is true and was one of the most fascinating elements of Mindy's research. Click here to see an excellent video from the History Channel about the topic. 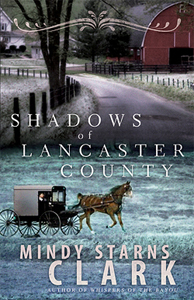 Have you read Shadows of Lancaster County yet? If not, you really should read it first before proceeding. Spoilers ahead! The Amish of Lancaster County have no prohibitions against seeking medical care. In some poorer communities, they may opt for home remedies before seeking out professional medical treatment. But there is no prohibition against, or stigma for, seeking good medical help. Similarly, the Amish are very cooperative with DNA researchers. There are even clinics in the Lancaster County region where researchers specifically study Amish DNA and the genetic disorders that plague the Amish. The Clinic for Special Children is an actual place, one that has been a true blessing to the Amish community. Visit their website to learn more. Stephanie de Beauharnaise was a real person, the adopted daughter of Napoleon and the wife of Karl Ludwig Friedrich, Grand Duke of Baden. Click here to see a painting of her, the same painting that is described in the final chapter of the book. Stephanie's journal accounts and other historical documents in this book were fictionalized, though they were based on her life at that time. In her lifetime, the real Stephanie gave birth to three daughters and two sons. Though her daughters survived to adulthood, both of her sons died shortly after they were born. Given that, it was widely rumored that the boys were killed by family members who coveted the throne. The chief suspects in her firstborn son's mysterious death were her step-grandmother-in-law Luise and Luise's eldest son, Leopold. Rumors also circulated that the royal child was swapped for a peasant child, who died and was buried in place of the young prince, and that the royal infant was spirited away to be raised or killed elsewhere. No charges were ever officially made. Though rumors of foul play really did exist, the idea that the royal child was swapped for a dying Amish infant was purely Mindy's own invention. There were Amish families living in the region at that time, so it would not have been an unreasonable assumption. In the end, whether Luise and Leopold were culpable in the infant's murder or not, they "won" the battle for the throne. Because Stephanie was never able to produce a living male heir, her husband changed a ruling that would have prevented the common-born Leopold from assuming the throne. In 1830, much to Stephanie's dismay and Luise's delight, Leopold became the fourth Grand Duke of Baden. Had either of Stephanie's lived, this would not have happened. Stephanie was widowed in 1818. She lived another 41 years after that, dying in 1860 in Nice at the age of 71. In her lifetime, she never publicly commented on the existence of Kaspar Hauser or whether or not she thought he might be her son. Kaspar Hauser was a real person whom many thought to be the rediscovered son of Stephanie and Karl. There was much mystery surrounding Kaspar and his background, and his story makes for very fascinating reading. There is an abundance of information about Kaspar Hauser, though much is contradictory and downright incorrect. In the end, the most reliable source Mindy found was the book LOST PRINCE: The Unsolved Mystery of Kaspar Hauser by Jeffrey Moussaieff Masson. The song "Wooden Horse," by Suzanne Vega, was written about Kaspar Hauser. When Mindy learned of it, she bought the lovely, haunting melody from iTunes and played it often as she wrote. Napoleon really did give his adopted daughter Stephanie a beautiful set of jewels known as the Beauharnaise emeralds. These emeralds are now housed in the Victoria & Albert Museum in London. The "sister set" of Beauharnaise Rubies is fictional and was invented for this story. 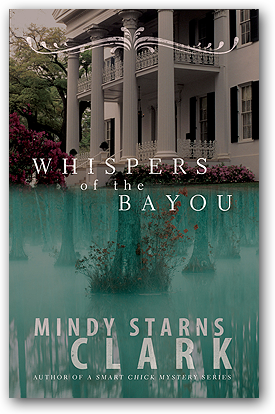 Have you read Whispers of the Bayou yet? If not, you really should read it first before proceeding. Spoilers ahead! 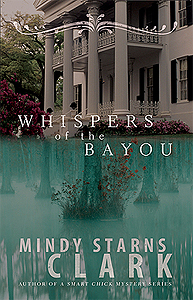 Though Cajuns are known for tall tales and myths, the expression "chucotement de bayou" or "whispers of the bayou" was invented by Mindy for this story. As far as Mindy can tell, there has never been a village in Nova Scotia called Colline d'Or, though certainly there was—and is—gold mined in the region where the Acadians lived prior to the expulsion of 1755. The concept of a village pooling their wealth for later security is purely fictional; there is no such angelus as described in this tale. 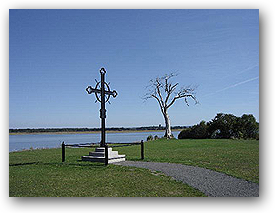 The elaborate-cross-inside-a-bell symbol is also fictional, though Mindy got the idea for it when she spotted the "Acadian Cross" that stands as a monument to the Acadians in Grand Pre, Nova Scotia (right). The story of the expulsion of the Acadians from Nova Scotia is true. Their tale is a heartbreaking saga of displacement, loss, death—and ultimately triumph in the face of tragedy. 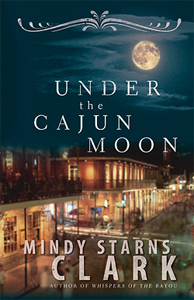 It is Mindy's hope that her story gives the proper respect to Acadian culture and lore and especially to these unique and delightful people group known simply as the Cajuns. They make her home state of Louisiana a more warm and musical and diverse place.